For scheduled birthday parties we turn our laser tag arena over to Nerf addicts! 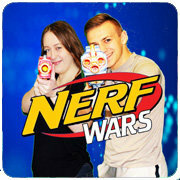 Nerf N-Stirke: Players ages 8 and up start in our briefing room for quick safety instructions. They are then equipped with safety glasses and an N-Stirke gun and ammo. Players are let loose in our abandoned town where they will dodge in and out of buildings, avoiding fire from other players. Nerf Rival will be added to our options at the end of April! Our insurance company requires us to follow manufacture guidelines. The minimum age requirement for Nerf N-Strike equipment is 8 years of age. We are sorry, but we can not make any exceptions to this rule! It can get warm while playing, so dress light and ready for fun! Remember that whites and other bright colors can glow under black lights, and you don't want to stand out! Wear comfortable shoes. No opened toed shows or sandals are allowed! Nerf Wars will be offered exclusively for Birthday Parties. Reserve Your Party Below!